With all the publicity that Free Range Chickens are getting at the moment due to Hugh Fearnley-Whittingstall's Chicken Out campaign, I really fancied a Roast Chicken myself this weekend. I wasn't planning on cooking for anyone except myself, but I wanted the leftover chicken for other recipes, and wanted the carcass to make the stock, too. However, I was slightly upset to find that none of the chickens in my local Waitrose came with Giblets. This was definitely mildly annoying as I wanted to use the Giblets to make the stock for the gravy at the very least. Still, it was a nice Chicken which I managed to cook just right so that the breast was still nice and moist without being undercooked at all. I think it's definitely worthwhile getting a chicken larger than you need so that there are enough leftovers for another meal or two as it's definitely cheaper than buying in smaller pieces of Free Range Chicken. With or without Hugh's Chicken Run, I'd been put off mass produced, Non-Free Range Chicken for a while after a documentary highlighting the fact that the burns often seen on the legs of these birds are due to them sitting around in their own filth all day long as they can barely stand up. Also, my Mum has bought free-range since we were kids, and I remember everyone commenting on the difference the first time she did. It is more expensive, but then, more recently, I have tended to go for more expensive pieces of meat, but just eat less of it, or at least, less often. 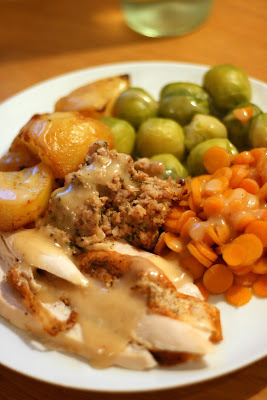 To go with the Chicken, I made a few Roast Potatoes, plus some Carrots and Sprouts. I reckon that most years I probably have sprouts only for Christmas Dinner, and very occasionally at someone else's house. I never cook them myself, even though I absolutely love them. I really didn't need all the stuffing I made, and ended up keeping most of it for sandwiches, but I wanted to make it simply because I'd never bothered in the past. I based the recipe on lots of similar stuffing recipes which I found searching on Google, and for me, it tasted great, so I'd definitely follow a similar route with that another time. In a food processor/blender, convert the bread to breadcrumbs. In a frying pan, cook and break up the Sausage Meat, until no longer pink. Remove with a slotted spoon and add to the breadcrumbs. If there is a lot of oil in the pan, pour away most of it, leaving a little to fry the Onion, Apple and Sage. Fry gently for about 5 minutes, then add to the breadcrumbs and Sausage Meat. Either blend together in the food processor, or simply mix by hand, ensuring all the ingredients are well mixed together. Put stuffing into the cavity of the Chicken. 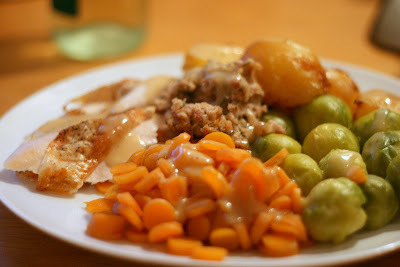 Any remaining stuffing can be cooked in a casserole dish, or rolled into balls and cooked for 30 minutes at 200 degrees Celsius. Cut the butter into two thin slices, then from the neck of the chicken, carefully lift the skin from the breast and insert the two slices of butter under the skin, on top of the breast. Sprinkle Freshly Ground Salt and Black Pepper over the skin, then cover with foil and cook in a preheated oven at 200 degrees Celsius, following the pack instructions (normally around 45 minutes per kilo of chicken, plus an additional 20 minutes). Remove the foil covering for the last 40 minutes of cooking.